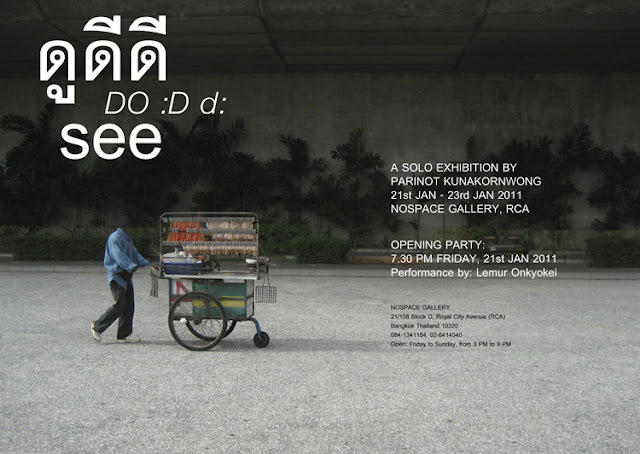 Parinot Kunakornwong is an independent artist, graduated Architecture from Chulalongkorn University and Audio Engineering from SAE Institute Bangkok. He worked as freelances in several fields of architecture& interior, music& sound, and visual art, and also well known as a bassist of ‘Cuckoo’, an Indie band. ‘DO :D d: (see)’ is a Parinot’s solo exhibition in the format of mix-media includes video, photo, painting, drawing, and installation. See simulated lives on TV"
‘"See’ an inquiry and search for imperfect beauty on the ordinary streets of Bangkok.